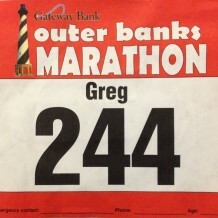 Home » Posts Tagged "outer banks marathon 2013"
On November 10, 2013, I ran the Gateway Bank Outer Banks Marathon. This write up is a report on my performance. 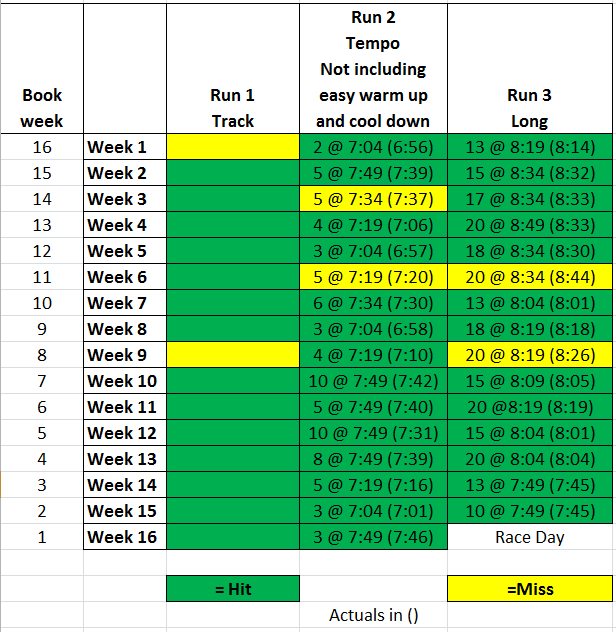 I trained using the 3:25:00 Boston Qualifier plan outlined in the book Run Less Run Faster. You can find summaries of those workouts here. If I can find some time, I may do an additional report on the actual event. Two thumbs up is the short version on the event, though. 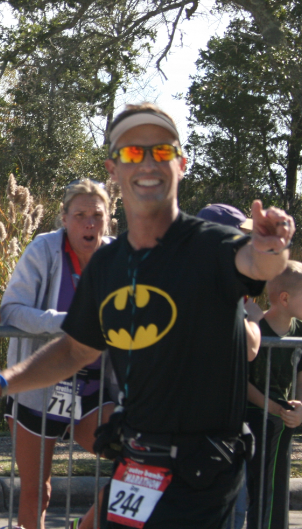 At 7:10am on Sunday, November 10, after 16 weeks of focused training and no less than 77 workouts, I was finally at the starting line for the Outer Banks Marathon. Despite only four hours of sleep before the race and waking at 4am (had to eat and then catch the shuttle to the start), I actually felt good and ready to run. The air temperature was about 50 degrees and the forecast was perfect. I removed my “donation” pull over and laid it on the ground beside the starting corrals. At 7:20am, the elites started and thirty seconds later, my corral was off and running (no elite corral for me :-)). I’d trained to run the race at a 7:49 pace, and I really wanted to make sure I didn’t start too fast. If there’s one lesson I keep learning the hard way over and over again, it is ‘Do not start too fast!‘. If I could hold the target for the first twenty miles, I’d try to run the last six at a faster pace. Thanks to my GPS watch, I could see I was too fast about the first half mile, so I slowed down. I hit the first split at 7:47. After a faster second mile at 7:42, I worked a little harder to slow it down. Third mile, 8:00. That put me right on 7:49, I see sawed up and down for a few miles, but through mile seven, I was right on track. I had a problem, though. This early in the race, I expected to still be feeling good having to dial it back as in my last few training runs, but I was struggling. My heart rate was too high for this early, and I was having to push too hard to keep my goal pace. This was not good. We weren’t even to the off road section yet, where I expected to have to give extra effort. As we entered the off road section at around mile ten, I was still hanging in there, right at a 7:50 pace. The first two miles of the dirt road, didn’t seem too bad. The ground was pretty firm, but fairly undulating. The scenery was nice. I managed 7:54 for mile eleven and 8:08 for mile twelve. At about mile 12.5, we turned off the dirt road onto the real trail section. 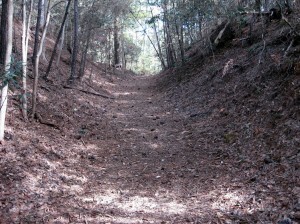 It was straight up a short, steep hill, then up and down hills for about a half mile. 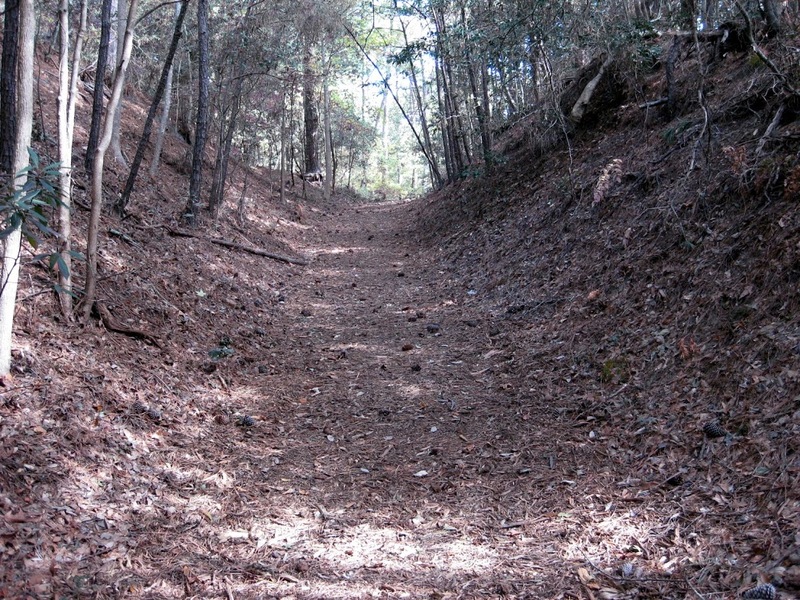 I didn’t think it was all that much different than the Harbison Forest trails I run occasionally. We exited the woods and my mile thirteen split was 9:19. Ouch. 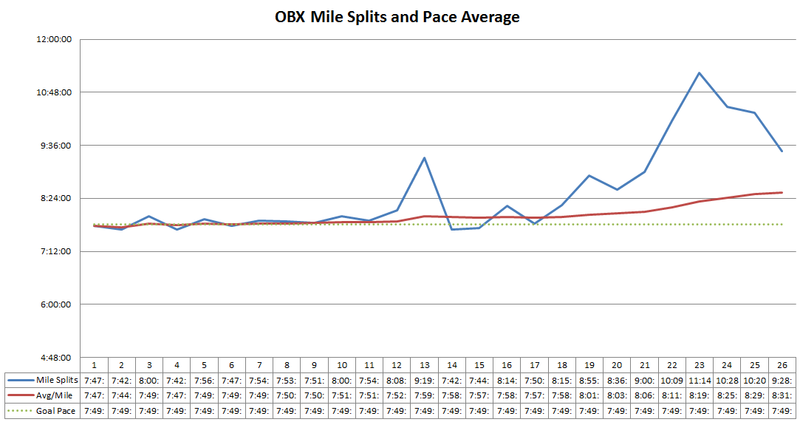 Overall pace per mile had slipped to 7:58. Now, I’m not a math genius by any means, but I knew this meant I’d have to run around 7:40 miles the rest of the way to meet my goal. I tried to ramp it up a bit. Mile fourteen was 7:42. OK, not bad. Mile fifteen was 7:44. Not horrible, but I still wasn’t finding a groove, though. Mile sixteen proved to be a struggle at 8:15. I gave one last super effort on mile seventeen for a 7:50, but that was the last I’d even come close to goal pace. Mile eighteen was 8:15, and I officially hit the wall during mile nineteen, coming in with an 8:55. After that, I just resorted to ‘just finish’ mode, running as much as possible but having to walk every so often. I felt terrible. The most brutal of the last six miles was mile 23, which included the bridge. I had an awful 11:14 for this mile. After that, I did manage to close with increasingly faster miles of 10:28, 10:20, and 9:28. My official finishing time was 3:42:30, an 8:30/mile pace. Believe it or not, this was a PR for me by 5 minutes and 10 minutes faster than my spring marathon this year. I was 14th of 76 in my age group and 125th out of 1,112 overall. Here’s a chart of my split times. The blue line is the actual times. The dotted line is the goal, and the red line is the pace average. Unfortunately, this chart follows a similar pattern to my other marathons. So what happened? How did I end up 17 minutes off my goal. That’s quite a miss. I wish I knew. I did run less and did run faster. After all, it was a PR. Am I happy with that? Honestly, no. It is a character flaw, I guess. Mr. Malcontent. My training success seemed to indicate I’d be much closer to the goal. I really expected to be on track the first twenty miles and then possibly struggle to a 9 minute pace over the last six miles, if I hit the wall. That would be a 3:31-ish worst case. My best explanation is the long trip up the day before (complete with broken down car and emergency car rental at the Fayetteville, NC airport) and lack of rest the night before really hurt more than I expected. I suppose the extra effort required on the trail section didn’t help, but it wasn’t any worse than the hills around my house where I trained. Everything else seemed to be on track – training, weather, nutrition. Maybe I’m just slow. Who knows. I guess stuff does happen. So what’s next? Not sure about that, either. I’m contemplating the next move. I do know, however, I will NOT wear a Batman shirt for my next race. What seemed like a fun idea at the time turned a bit annoying by the end of the day as I received way more than my share of Go, Batman!, along with chants of the old TV show theme song and one old guy pointing out his Chuckie T high tops with Batman logos. It was fun high-fiving the little kids, though. Hey, guess what? 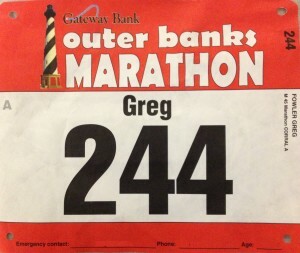 I’m running the Outer Banks Marathon on Sunday, November 1oth. If you’ve read my posts over the past four months, then you are probably tired of hearing about my preparation. I understand. I am certainly tired of training! Here’s some information on what I’ll be facing on Sunday. After my disappointing second half on the killer hills of last March’s Columbia Marathon, I decided I wanted to go back to the coast for a flat marathon. My personal best was at Myrtle Beach in 2011. 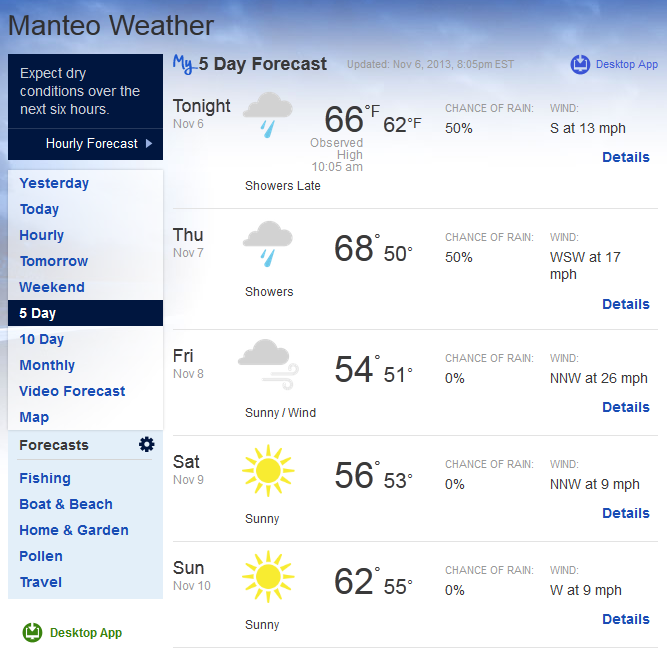 I also wanted a fall race, where most training would be in the summer heat, but race day would be cooler. This is the opposite of spring races where I’ve trained in the cold only to be hit with too warm conditions late in the race. So, given those requirements, a few close races meet the mark. There is Kiawah Island near Charleston, SC in December. Also, there are two November races, Savannah (Georgia) Rock ‘n Roll and Outer Banks, North Carolina. I decided Kiawah was too close to Christmas and, besides, I’d done it once. So, that left the other two. 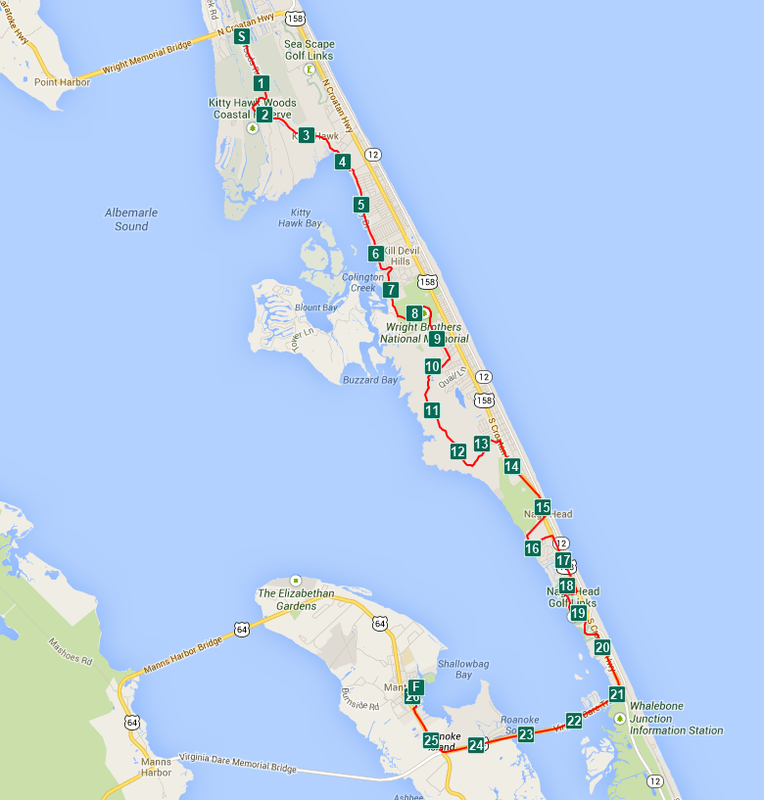 Despite not visiting Savannah in quite some time, I decided to go to Outer Banks, where I’ve never visited. While the course is extremely flat compared to the Columbia Marathon and my usual training routes, there are two spots that will make it harder for me to reach my goal of qualifying for the Boston Marathon. The first is around mile 10. The course organizers decided to showcase some local trails and threw in about a 5K’s worth of cross country running. The first 2 to 2.5 miles of this appears to be on hard packed dirt roads, but we take a turn about the 12.5 mark onto mulch covered sand dunes trails. Hmmm. Sounds like quicksand to me. 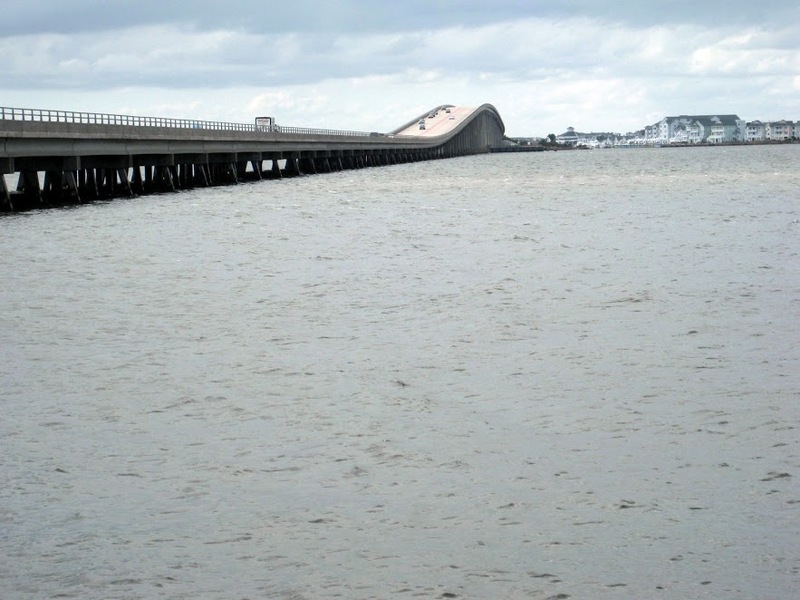 The second point of concern is around the 22-23 mile mark, the Washington-Baum bridge over Roanoke Sound. On the elevation map, it is barely a blip, but at mile 23 it will seem like Mount Everest. 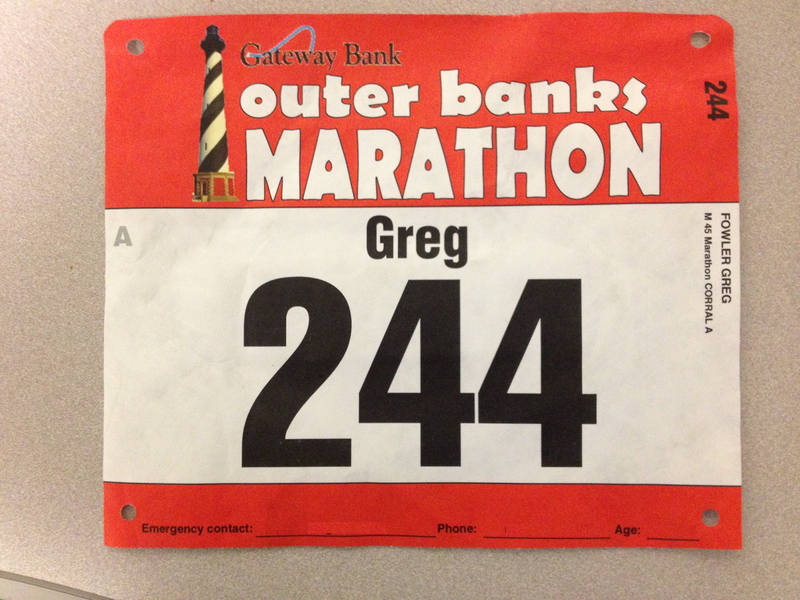 My goal for this race is to beat 3:25:00. This is over 22 minutes faster than my previous marathon best and would qualify me for the Boston Marathon. The goal may be quite a stretch, but my training has come together nicely over the last two months. I’ve completed all my planned workouts and feel great. It is gonna be close. Click on the image below for more details on my training with the Run Less Run Faster program. Now I just have to make it to the starting line. I’ve made some planning and logistics mistakes, but that’s another story.